The next time you are shopping or dining at your area mall or restaurant, see if you can find these popular ADA signs. Pull your vehicle into your local shopping center, and you are bound to drive by handicap parking signs or state-specific California disabled parking signs (if you live in that state). Such parking signs let you know that the space is reserved for those with DMV issued disabled placards or license plates. You should also see the familiar wheelchair pictogram on the pavement. As you park your car and begin to approach the building on foot, you are likely to see a number of disabled guide signs. Such ADA guide signs, often with an arrow, let disabled people know where -- and the easiest way -- to enter the building with an equipped door entrance. As you get near the door entrance, you may notice handicap decals on the window showing the universal symbol of accessibility. Such static-cling stickers let everyone know the building is friendly and accessible to those in a wheelchair or with other disabilities. Once you enter the building and start to walk around, you can easily find ADA restroom signs. Typically there will be a wall sign with raised pictogram(s), lettering and braille. The door should have a triangle for men, circle for women or both a triangle and circle for unisex restroom. You may see ADA braille room signs for offices, which can be customized with a person’s name and job title. In addition, if you are trying on a new outfit at your favorite clothing store, you might see custom ADA signs for a fitting room. Required by ADA compliance regulation and fire codes, you are likely to see braille exit signs and emergency exit signs when you go to leave the building. These tactile exit signs, which include raised braille lettering, are very important as they let blind or visually impaired individuals know where to exit the building in case of an emergency. Though you may not have considered it before, businesses and other organizations use different types of ADA signage to welcome patrons with disabilities. 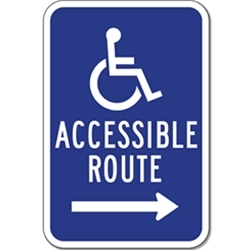 If you are looking to order ADA signage, decals, or handicap parking signs for your business or organization, visit StopSignsAndMore.com for compliant and high-quality signs. Remember: California has the steepest penalties for businesses that fail to comply with ADA regulations, and braille signage is required by law. About us: StopSignsAndMore.com manufacturers sturdy, made-to-last aluminum signs right here in our California-based factory. Our ADA signs meet federal and state compliance standards so you can order your parking signs or other ADA signs with complete confidence. Email: [email protected] to learn more.